The New One won the Aintree Hurdle on day one of the Grand National meeting, gaining compensation for an unlucky defeat at last month's Cheltenham Festival. Sam Twiston-Davies rode the 4-9 favourite, a fast-finishing third to Jezki in the Champion Hurdle, to win for his trainer father Nigel. It took a photo finish to decide the winner after a thrilling conclusion. Noel Fehily rode Rock on Ruby to second with AP McCoy and Diakali in third. The New One looked to be holding both at bay as he raced towards the finish but, as the line approached, his two challengers on the other side of the track were bridging the gap and the trio passed the post almost as one. The photo showed The New One had prevailed by a head, with Rock On Ruby just second ahead of Diakali. 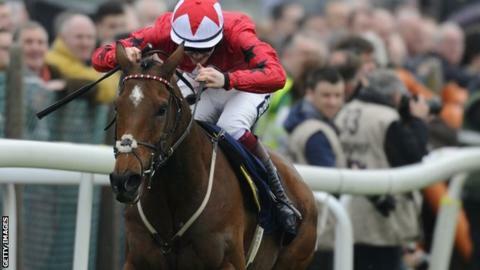 Twiston-Davies said: "He was hit and miss, jumping wise. I didn't quite get into the same rhythm as I did in the Champion Hurdle. "He probably had a hard enough race [at Cheltenham] which took off some sparkle, but you can't underestimate how good a performance that was. He's a classy horse." In the third race of the day, Silviniaco Conti won the Betfred Bowl for Fehily and Paul Nicholls. The King George VI Chase champion, a 9-4 shot, set a good gallop from the outset of the three-mile-one-furlong contest, closely pursued by last year's winner, First Lieutenant, ridden by Barry Geraghty. The pair led their rivals into the straight, with favourite Dynaste, Argocat and Menorah all laying down a challenge. Dynaste eventually emerged as the biggest threat to Silviniaco Conti, who wandered across the track, but Nicholls' charge jumped the final fence well and kept up the gallop to win by a length-and-a-half. Argocat came through to grab third from First Lieutenant. In the opening race of the meeting, Guitar Pete came from a long way back, ridden by Paul Carberry, to win the Injured Jockeys Fund 50th Anniversary 4-Y-O Juvenile Hurdle. The 13-2 chance was towards the rear rounding the home turn but found top gear as he beat Clarcam and Calipto into second and third respectively. Father-son combination Robert and Sam Waley-Cohen teamed up to clinch their third victory in the Fox Hunters' Chase with Warne over the Grand National fences, ahead of Tartan Snow and Mossey Joe. Meanwhile, Paddy Brennan won the Red Rum Handicap Chase on Parsnip Pete, Uxizandre was ridden to victory in the Pinsent Masons Manifesto Novices' Chase by Tony McCoy and Doctor Harper and Tom Scudamore triumphed in the Dominican Republic Handicap Hurdle. Humans have got much faster... so why haven't horses?